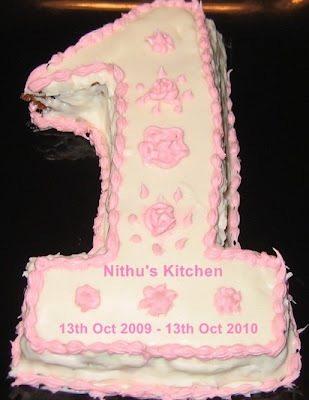 Thank you friends for your wishes on my one year completion in this blog world. Here goes the recipe for the Eggless Carrot Cake, I made. 1. Pre-heat oven at 350F. 2. Grease 8 inch pan. 3. Mix all the dry ingredients in a bowl. 4. Combine ghee, vanilla extract, lemon juice, orange juice and milk in another bowl. Stir well to blend all the ingredients. 5. Now, add this to the flour mixture. Blend until smooth. Stir in raisin and grated carrot. 6. Pour the batter in to greased pan and bake for 30 minutes or till wooden pick inserted in center comes out clean. Congrtas Nithu on one year of blogging and carrot cake looks yumm yumm...would love to have a slice..
Lovely cake,Nithu. Congrats on your first year. Nice one, I love carrot cake, very pretty! Congratulations.. Nithu. Lovely cake . Do visit my space whn time permits. எக் லெஸ் கேக் பாக்க நல்லாதான் இருக்கு .அப்படியே ஒரு பார்ஸல் அனுப்பினா சாப்பிட்டு பார்த்து டேஸ்ட் நல்லா இருக்கான்னு சொல்லுவோமுல்ல ..!!! ((( intha word verificationai eduththudungalen beriyai thalaivaliyaa irukku ))) இங்கிலீஷ் காரன் பிளாக்கில தமிழ்ல எழுதினா யாருக்கு தெரியப்போகுது ஹி..ஹி..
Wowwww carrot cake looks absolutely yummy, soft and super moist..awesome work Nithu..
congrats- looks just fit for the occasion! yummy look indeed! Way to go,carrot cake looks very nice,thanks for the recipe!